Ahhh, summer vacation! The sun, surf and sandy beaches. When I created this handmade jewelry set the first thing that came to mind was, 'Aloha'! Start your summer vacation with this beach stylish handmade beaded bracelet and bead earrings set. You can wear the bracelet and earrings separately or pair them together for the perfect summer accessory. 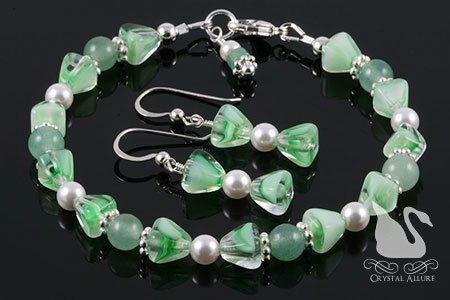 Design features both jade gemstone and aventurine gemstones, white Swarovski Pearls, peridot green pyramid-shaped Czech glass beads, sterling silver beads, clasp and earwires. Beaded bracelet measures 7-3/4"; bead earrings measure 3/4" from the bottom of the earwire. The green aventurine gemstone is thought to be the luckiest of all crystals. It is said to release old patterns, habits and disappointments so new growth can take place. It also brings the wearer optimism and a zest for life. Jade gemstones are a symbol of serenity and purity. It is a protective stone and brings harmony to the wearer. Jade attracts good luck and friendship. As the "dream stone" it stimulates ideas. Jade is excellent for treating kidney problems and adrenal glands. Wear both these gemstones together and life is near perfect! Aloha! It's been a frustrating and tiring past week. 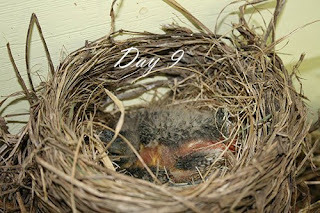 We made every effort we could think of to save all the robin babies, without causing the mother to abandon the nest. But, it just wasn't enough. We reached 10 days of life and it all came to an end at 12:30 in the morning. I'm a cat lover, but I am not very happy with the orange cat roaming around our neighborhood right now. These are the last of the pictures I have of the babies. 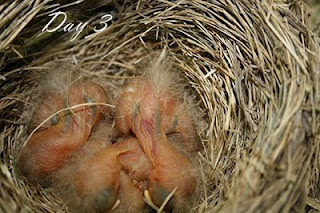 Going into day 8 we still had two and they were healthy and growing, as far as we could see (even after being thrown from the nest!). Although the one toward the back of the nest looked smaller. By day 9, tragedy had stuck again and only one was left. I didn't get a great picture on this day because I didn't want to disturb the nest and baby any more than it had been already. It was also on this day that we took our last ditch effort at saving the last bird by cutting the huge porch wreath that the nest was build on into about 1/4 of it's total size. This left about a 1/4 half-moon shaped piece of wreath (which the nest sat on top of) secured to the top of our shutters. We also put this netting on the porch and fashioned to act like a hammock of sorts. With the thought that if the cat couldn't get any traction or balance to jump up, it couldn't reach the baby -and with the wreath missing, the cat also couldn't climb up the wreath to the top. If you look really close at the day 9 picture you can see the little guy's eye is open. I'm sure he's huddled in out of fear. Poor little thing. We got through the night without incident and on day 10 the little guy was still there. I nick-named him "rocket" because now that he was older and stronger, when mama robin came to feed him he would shoot out of his nest so much so that I thought he was going to lift off! You can see in this picture too that his eyes are open, he's got most of his feathers now and looks pretty good overall. We went to bed that night thinking we had solved the problem and it was going to be okay. Then while in a deep sleep, I have no idea how I heard this, but I heard a noise and as I bolted awake I processed what it could have been. As I threw the covers back (and swore out loud -tsk, tsk) I ran downstairs and looked outside. All looked quiet and nothing looked disturbed. But I wasn't satisfied. I went outside and although I didn't look in the nest, I did notice the nest was farther away from the house than it should have been. I think in my heart of hearts, I knew and just couldn't muster the energy or emotions to look. I did search around the porch and again, nothing looked disturbed. But, next morning my husband confirmed he (the last baby bird) was gone. I was so angry and so tired. We tried so hard and it just wasn't fair. I had to strongly supress the feelings of what that bird must have gone through. All I could hope was that it was quick. Strangely, when I went outside to investigate (after I heard the noise), mama robin wasn't around -she wasn't even giving her warning chirp. I thought that odd. As of today, she hasn't been back that I've noticed. It's all just so sad. Here is a handmade beaded watch fit for any occasion -any outfit! Oozing with sophistication, frost glass teardrop beads are accented by the cool of sterling Bali. This stunning Black Frost Sterling Bali Beaded Watch is pure sophistication! It's a handmade beaded watch in a black and white style that is wardrobe friendly and easily transitions from your daytime wardrobe to elegant evening wear. 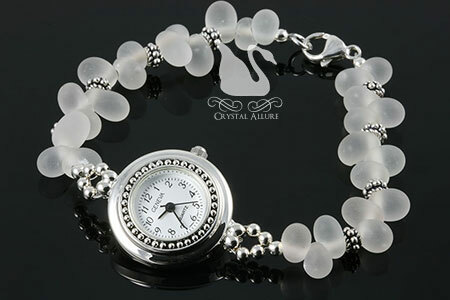 Design features white frosted Czech glass teardrops accented with .925 Bali and sterling silver beads with a Geneva quartz white beaded-edge watch face. Measures 8-1/2". Check out the matching Shimmering Frosted Drops Crystal Beaded 3-pc. Jewelry Set (N082). Sadly, mama robin has lost two of her birds. It's been a heartbreaking last few days. Day 5 (Thursday) started out fine. 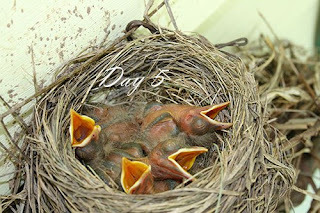 All four birds accounted for, poking their heads out for food, growing bigger everyday, getting their feathers..
Then early Friday morning, around 6:30 a.m. we hear a loud crash on our porch. My husband was working at the computer and I was still sleeping. I immediately jolted awake and just knew it was not going to be good. I heard my husband rushing back in the house from the porch, I jumped up and still half groggy mustered the courage to ask, "are they dead?". All he could say was it wasn't good. I had made the mistake of leaving our wicker furniture on the porch in its usual spot, which is directly under the wreath. I don't know what I was thinking. Well, a cat had decided to take up this opportunity and attack. It must have jumped on the wreath because the wreath came down, hit the table and ejected all the little birds from their home. 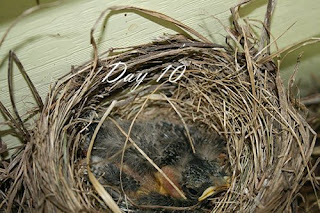 My husband said he got on the porch and there were just little birds everywhere. To make matters worse, the cat had really gotten one (there was a little pool of blood about a foot or two away from the nest....and next to it was one of the little birds). My husband set about reattaching, more securely, the wreath to the hanger and not knowing what he should do, he just put the birds back in the nest (wearing a pair of gloves). He said they were moving -even the little one who had been bitten. That was the hard one, he wasn't sure what to do. But because it was still moving and he didn't have the heart to end its life, he put that one back in the nest too. That was day 6. From the pictures, you can clearly see three...we think the injured one was too weak and may have been "pushed" to the bottom of the nest. It was a horrible beginning to the weekend. Our hearts were broken. And it didn't end there. We picked up some 'have a heart' critter away stuff, put it on the porch but not directly in front of the nest -even though it didn't say anything about it detering birds. We again don't know what went wrong but the next morning there was only two birds in the nest. We were baffled because just the night before we watched mama robin feed all three birds left, all were poking their heads out of the nest and eating. The next morning, one was gone. There are only three possibilities that we could come up with. One, the cat came back and entered on the porch from the front, directly in front of the nest which is a spot we did not use the critter away on -and then proceded to jump on the wreath and either climb it and knock out a baby or jumped on it in such a fashion that the baby bounced out. Another possibility was that it was dying (which we really don't think was the case) and mama removed it from the nest (because we think she removed the dead one since we can't see it but we really don't know for sure). The last possibility was that another bird came and stole it. In some ways, it was really worse not knowing what happened. To combat what we thought might be a cat again, we wrapped the bottom of the wreath with aluminum foil and also put a strip of foil along the porch under the nest. As of this morning (Sunday -day 8) there were still two in the nest. We are hoping these two are okay from the fall they took and that all is good. I guess all we can do is hope. 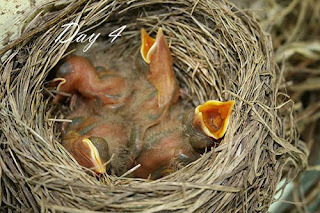 I've read that once they hatch, they could be attempting to fly within another 14 days. That will be another challenge when the time comes. Each day they get bigger and bigger! Although what I'm quite surprised is how big they got in just 1 day. 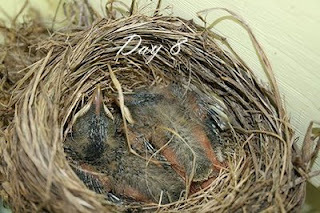 For whatever reason, it was difficult to get the correct angle for both days, but day 3 shows a really close up picture of them...all snuggled tight and sleeping, well, like babies! The Baby Robin Birds Are Here! 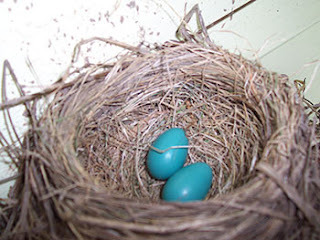 After reading up on the incubation period of Robin eggs, I estimated mama robin's eggs would hatch sometime between Sunday and Tuesday (today). 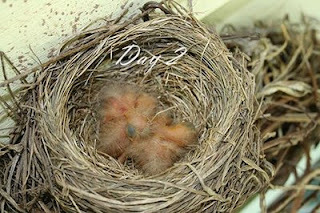 Sure enough, we got home Sunday and I quickly peeked in the nest and BABIES!!!! 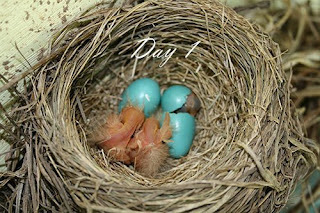 The first picture (Day 1 -Sunday) shows two hatched, one on its way and one still yet to hatch. 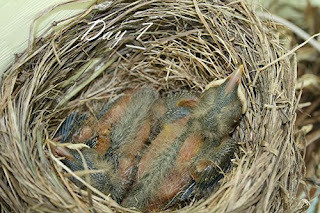 This second picture (Day 2 -Monday) shows them all hatched and huddled together for warmth. I believe I count all four. I'm usually snapping these pictures quickly as mama is in the nearby tree...and well, I'd rather not get my head pecked by mama bird! It is my hope to be able to get a picture each day until they have 'flown the coop' so to speak. I hear once they hatch, they're gone from the nest super quick. So, I've got my fingers crossed...stay tuned! Crystal Allure's First Blog Award!! 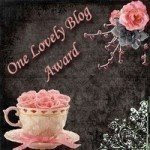 Today I discovered Kristina from Bouncing Off The Walls Blog awarded Crystal Allure the One Lovely Blog award! We've never won/been awarded anything! Thanks so much for passing this award on to me! 1) Accept the award, post it on your blog together with the name of the person and company/blog name who has granted the award, and his or her blog link. Here are some of my favorite blogs that I am passing this award onto, please check them out! The Beading Gem's Journal -check out the latest "Readers Gallery"! Snap out of it Jean! There's beading to be done! 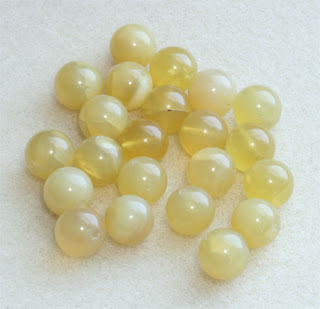 If you are looking for the perfect touch of warmth and character for your jewelry project, these yellow opal gemstones are a must. 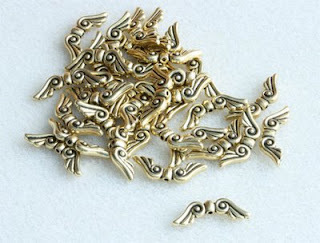 The warm tones and variations of yellows make each bead truly unique! Opal is known for its inner glow. 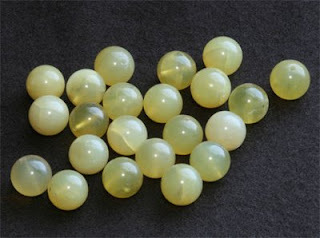 Use yellow opals in your jewelry designs for good luck and a more positive outlook on life. A favorite customer of mine recently requested some custom jewelry pieces and while we talked I introduced her to some new beaded gifts coming down the road. She then mentioned her son's girlfriend was graduating Mother's Day weekend from St. Francis University with a Master's in Education -and these new beaded gifts would be the perfect graduate gift to give. She then requested a custom design in our upcoming new beaded pens and beaded pen sets (stay tuned for this new gift line). The college colors for St. Francis University are black and red. I immediately began shopping for the perfect beads for this beaded pen set and struck gold with these stunning artisan lampwork beads. "The set is absolutely beautiful (as I knew it would be). I was planning to send the gift with my son to the graduation, but now I am thinking that I may be able to catch her this week. I really want to be there when she opens it." Congrats Amanda!! And thank you Mary Kay for your custom order! And Then There Were FOUR!! 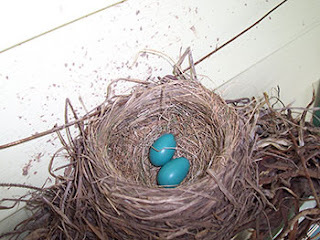 Yesterday, after work, I peeked into the Robin's Nest to see if there were any hatched babies and was surprised to find....two more eggs added to the nest! 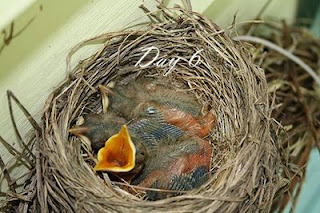 I thought once a bird lays their eggs that was it (until the next cycle). I didn't think they laid them at separate times -or quite possibly the day I was taking photos of the first two eggs, I interrupted her before she finished laying them all. Not sure, but so excited there are now four. Mama Robin has been sitting on her nest quite a bit since I found the first two eggs so I think it could possibly be any day now? At the start of work today I found my Moss Agate Gemstone Pearl Beaded Watch (W09) was a listed feature in the new Reader's Gallery over at the The Beading Gem's Journal! So excited! Thanks Pearl. (1) They are really bracelets -which are my favorite pieces AND they are what Crystal Allure is known for. As well, unlike other pieces of jewelry, when you purchase a bracelet (or watch in this case) you (the purchaser) actually gets the benefit of being able to admire the beautiful jewelry. It is for our enjoyment. (2) They are functional for everyday life. Not only do you get the beauty of a bracelet but it serves a function of giving you the time in a world where our lives are so busy. 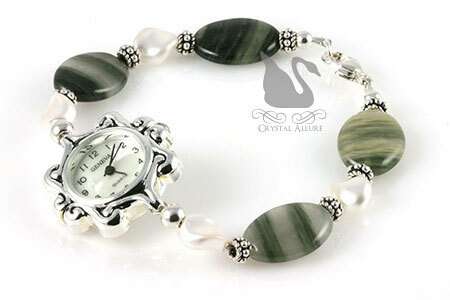 If I were to highlight a specific watch that is currently available, it would be the Moss Agate Pearl Elegance Beaded Watch (W09). The reasons would be because of those listed above -I love green -and because prior to making it I had read that moss agate resembles moss or trees from a distance and it is said to assist in finding hidden treasures and it is believed to bring the wearer health, friends and riches. Which is something I would wish for the person who purchased it! Check out the coordinating Moss Agate Gemstone Crystal Bali Beaded Necklace (N036)! Did you know coco beads are made from the coco shell of a coconut tree? If you are a "green girl", you're going to love these natural, organic earrings and necklace! Both pieces are one of a kind, handmade and in a simple design that uses natural materials and are comfortably light weight. A true nature girl necklace! Both riverstone gemstone and smoky quartz gemstones contrast well with the 2" diameter coconut shell circle pendant. Each gemstone bead has been delicately wire-wrapped with 14 karat gold-fill wire and chain. Necklace length is 19". 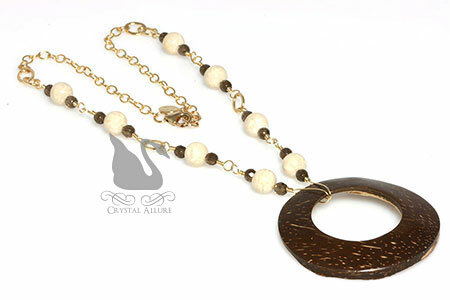 Pair this nature style necklace with the Coco Shell Teardrop Beaded Earrings (E236) for a can't miss combination. 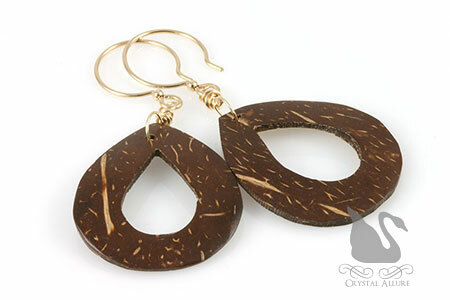 This handmade earrings design features a 1" (at widest point) by 1-1/4" long natural coconut shell teardrop wire wrapped with 14 karat gold-fill hoop earwires. Length is 1-1/2" from the bottom of the earwire. Celebrate Mom anytime of the year with one of our MOM bead keychain gifts. Get this unique Mother's Day gift available in a lovely pink carved river shell rose charm, MOM message bead, beautiful crystals, pearls and sterling silver. Mom is sure to love this daily reminder of how special she is! And she can use it for her keys or as a purse charm. Celebrate Mom with our lovely pink carved river shell rose bead charm. Features a sterling silver "Mom" message bead, beautiful pink rose Swarovski Crystals, white Swarovski Pearls, sterling silver beads and finished with a heart shaped keyring. Length is 4-1/4" (not including the heart keyring). This past weekend I took some time to enjoy the sunny weather we were having (which doesn't occur often here!) 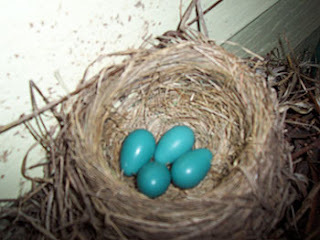 and discovered a Robin had made her nest on my porch! At first, I had thought someone put it there (because family and friends know how much I love birds, nature, etc) but upon closer inspection, I found it was the real deal....with the mud paste all over my house siding to go with it. 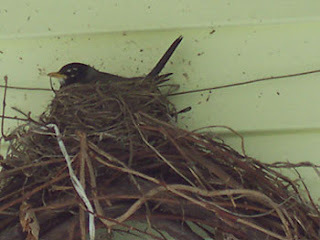 But, that's okay, I'm just excited to have a mama bird on my porch! 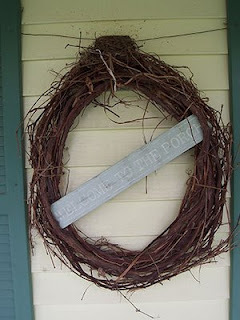 I had hung up this huge wreath and put a decorative sign in it that said, "Welcome to the porch" and ironically, that's where the Robin built her nest -right on top of the wreath! 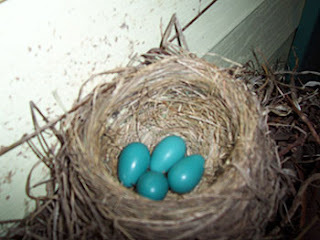 I took a closer peek when she wasn't there and YEA there's two little blue eggs! I've included some pictures below...now it's just waiting for the little babies to hatch! I'm so giddy with excitement! Upon waking up this morning from my oh so comfortable bed, I realized it was May. That lead me to realize Mother's Day was fast approaching. Where did the time go? I hadn't even prepared for Mother's Day yet SO to compensate for this lack of preparation, I'm holding a CAN'T MISS beaded necklace sale! From May 1st through May 4th, the entire necklace collection is on sale and you can save up to 40% off! 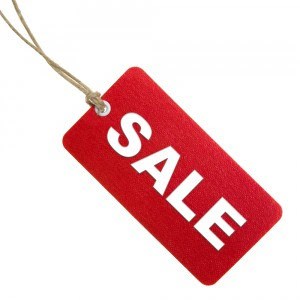 This sale even includes the necklace sets that were just on feature special. So, don't waste time, hurry on over to the website and pick up your one of a kind necklace for mom before its' gone. To have your order arrive in time for Mother's Day, all orders must be received by May 5, 2009.